The leaves, once green, looked slightly wilted and as yellow as a stack of hay. The garlic-infused butter refused to show itself. The crunch that defined the first bite was now gone. No doubt about it — my bok choy was depressed. Okay, maybe not the bok choy itself. But the person who made it, perhaps? Why else — if not for that carelessness caused by depression — would you pick a bok choy that was a day past its sell-by date, garnish it half-heartedly, and cook it for a minute or three longer than prescribed by the recipe? I wanted to verify whether the chef was feeling low on the day I visited. But no, I didn’t ask to see him/her to offer my condolences — I have a sneaking suspicion I would have been regarded as insane had I even asked. Can love taste like a red velvet cupcake? I don’t know. But it can taste like over-concentrated lemon tarts on certain days. Can pride taste like freshly baked bread at four in the morning? I know I’ve tasted it in sickeningly sweet ‘Death By Chocolate’ time and time again. Can food convey emotion? I think it can. I did, after all walk away from bok choy that day, thoroughly convinced that food can, if you really listen with your eyes, nose, and taste buds, have a heart-to-heart conversation with you. 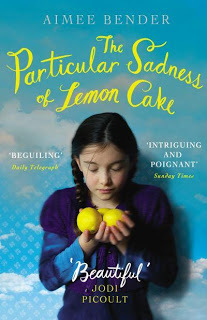 Thus, in a lot of ways, it isn’t difficult to empathise with little Rose Edelstein, the young heroine of Aimee Bender’s novel, The Particular Sadness of Lemon Cake, a book that has me obsessing over the emotions of food. We meet our gifted protagonist as an eight-year-old, who tucks into her favourite dessert — Mum’s lemon cake — one day, and discovers that her mother is depressed. As time goes on, she finds that she can taste not only her mother’s emotions, but also those of seemingly chirpy strangers. The artisanal shop in her suburb, for example, has chocolate chip cookies that are angry, oat biscuits that are in a hurry, and a sandwich that wants you to love it. Rose struggles to bring her head around to feeling so many intense, complex emotions — guilt, hunger, craving, and most tragically, sadness — during a very formative period of her life. You feel depressed, almost, when you read about how it plagues her to taste emotions that people didn’t even know they were feeling. Sure, it sounds like the kind of gift you and I would consider selling a kidney for, if it came down to it. But as you read more and more of the book, you’re not so sure anymore. You look at the world and even at the food around you and wonder about the emotions that went into making it. You seriously wonder if you want to know what those feelings are. I can tell you right away that the answer depends on how bored or beer infused you are. But how you find out is something you cannot control. What I loved about this book is that it makes you look at the world of food differently. You bite into a kebab and try to tell whether it’s happily married to the spices that coat it. Or if it’s hiding behind a veil of artificial colour. You also pick at slices of fruit wondering if they’ve been cultivated and picked by hands that know they’ve done it justice, or just done the bare minimum to fill a hole in a market run by demand and supply. These are things I’ve wondered about extensively over the past few years but lacked the vocabulary to express myself. Now I realise that food, like emotion, is simply complex. Your dinner plate might not know what it’s feeling. But you, as a friend good enough to keep a bottle of red tucked away for emergencies, do. An edited version of this review was originally published in Helter Skelter magazine on 14/4/2013.